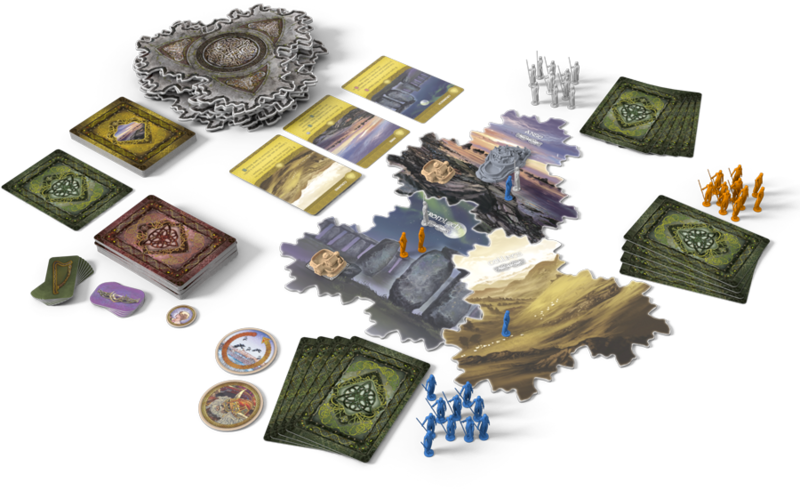 Rule over ancient Ireland in Inis, a two-to-four player board game designed by Christian Martinez. Inis invites you to experience the magnificent deeds of Irish myth as you explore the island’s enchanted landscape and claim territory for your clans. The game’s elegant mechanics combine card drafting and area control to produce a system rich in strategic options and interpersonal interactions. Brilliantly crafted tiles give every game a unique, gradually unfolding geography, while original art brings Ireland’s ancient epics and audacious heroes to life. 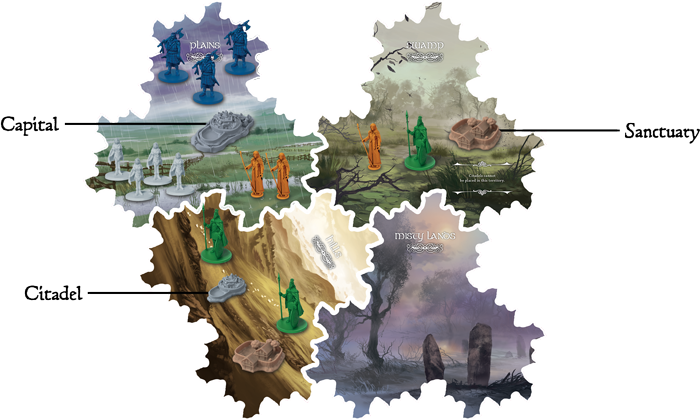 Lead one of Ireland’s first peoples and perform legendary exploits in Inis, a two-to-four player board game designed by Christian Martinez and lavishly produced by Matagot. Inis immerses you in Ireland’s mythological era, its fierce heroes, enchanted objects, and beautiful mist-covered landscape. Your goal in Inis is to become Ireland’s first High King. Among your allies are the warrior Cuchulainn, the beautiful and tragic Deirdre, and the exiles Diarmuid and Grainne. Your tools include a magical spear, horses made out of sea-foam, a god’s cauldron, and all the cards you can gather into your hand. 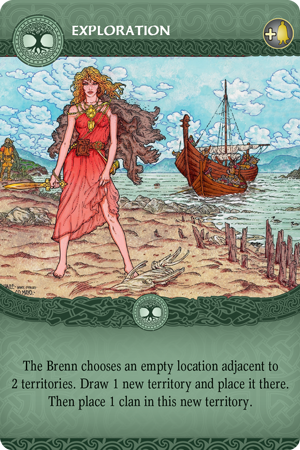 In Inis, there are three conditions of victory, and you must achieve at least one more of them than your opponents in order to win. None of them are intrinsically easier than any other, making for tight, intensely competitive endgames. The first path to victory is to simply spread your clans into six different territories. The second is to become chieftain over a territory where at least six of your opponents’ clans also dwell. The third is to occupy territories where a combined total of six Sanctuaries lie. In this scenario, the blue player and white player are tied for victory. Together, the territories occupied by the white player contain six brown Sanctuaries. The blue player isn’t present in as many territories, but in the two territories she occupies, she has majority rule over a total of eight opponents’ clans. The game will continue until one or the other achieves a second victory condition, and if they both achieve it at the same time, until one achieves a third. You’ll spread your clans throughout the isle, establishing Sanctuaries, and gaining control over territories through the simple act of playing cards. 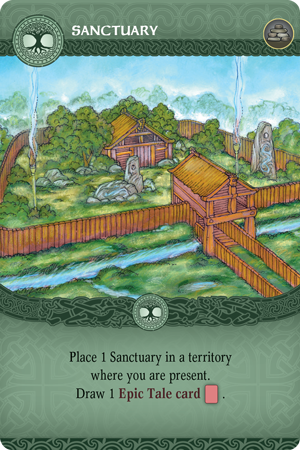 All actions in Inis, from discovering a new territory to fighting, are card-driven, and you obtain many of those cards through the simple and intrigue-laden process of drafting. Each round of Inis comprises two parts, the Assembly and the Season. In the Assembly you draft Action cards, which enable most of your actions and which cannot be kept from one round to the next. Even in this stage, you have more power if you are chieftain of at least one territory, meaning that you have more clans there than any other player. 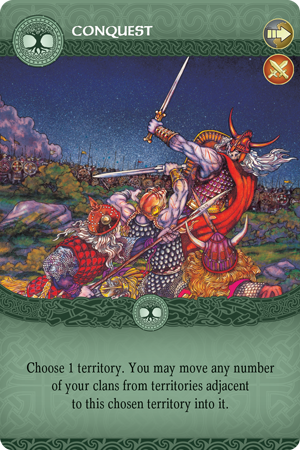 Being chieftain of any territory enables you to take its Advantage card for the next round. The chieftain of the territory where the Capital lies is known as the Brenn. Here, the white player controls the Capital and so becomes Brenn. The green player, however, is Chieftain over the Hills, and so takes that Advantage card. Neither the green nor the orange player has a majority in the Swamp, however, so neither can be called Chieftain. Playing a card with the Season symbol constitutes an action. 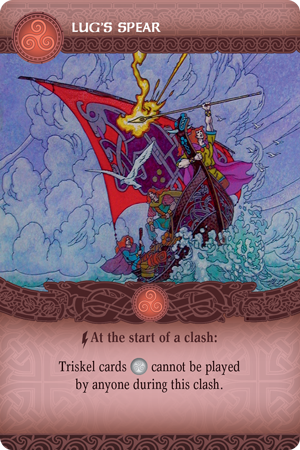 Triskel cards, however, are played whenever the conditions they describe are met, whether or not it is your turn, without requiring an action. Now the Season starts. Beginning with the Brenn, players play one Season card per turn, but you always have the option to pass. The Season ends only when all players have either chosen or been forced to do so. As in any card game, when you perform an action is just as important as what action you perform, especially for Triskel cards. The option to pass should also be carefully used. You may hold one of your cards until others have used all their actions in order to build a Sanctuary that no other clans can reach, rush into unoccupied territory at the last minute, or lead an opponent into a fatal clash. Whenever you move a clan into an occupied territory, you instigate a clash. Other players with clans there have a chance to protect them by placing them in Citadels, if there are any. Then, you have a choice. You can attack, and force your opponent to either lose an unprotected clan from that territory or discard a card and thus likely lose an action that round; you can use a maneuver from one of your Triskel cards; or you can withdraw your clans to another territory that you occupy. Then, if they still have unprotected clans in the territory, the player you attacked chooses one of those three maneuvers in return. A clash ends when there are no more unprotected clans in the territory, or when all players agree to end it. Note that none of the victory conditions mandates that your clans occupy a territory alone. Be judicious when you attack, how many clans you invade with, and when you end the clash. There will be times when the best tactic is to eradicate an opponent’s clans or force them out of the territory entirely. There will be just as many times when you simply want to diminish their number, or even peacefully coexist. Once a Season is over, Action and Advantage cards will vanish from your hand. 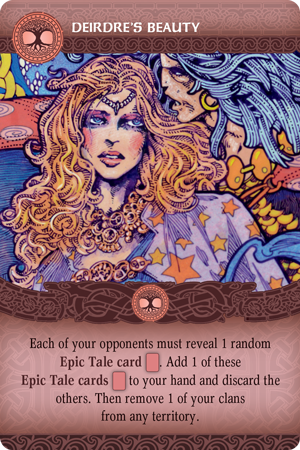 Epic Tale cards, however, are yours to keep until the moment is ripe. You can gain Epic Tale cards through some Action cards or other Epic Tale cards, and given their powerful, unique abilities, you’ll want to have as many as possible in hand. Each Epic Tale card draws upon at least one ancient Irish myth. Lug was a warrior, bard, sorceror, and craftsman who led the Tuatha Dé Danann to victory against the Formorians. The holiday Lughnasa still honors this hero-deity. 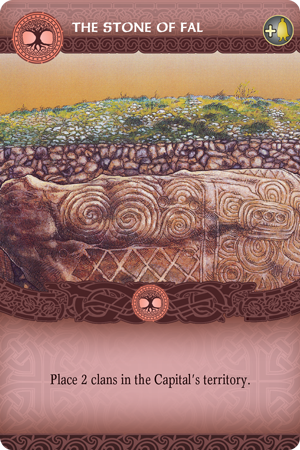 The stone of Fal, or Lia Fáil, was brought to Ireland by the Tuatha Dé Danann from their sacred, enchanted homeland. It is said to roar in joy when the island’s rightful High King puts his feet on it, and still stands in County Meath today. Deirdre was the daughter of the royal storyteller, whose beauty caused the death of several men and ultimately, her own. In some ways, she personifies Ireland: beautiful, sought after, and deadly. 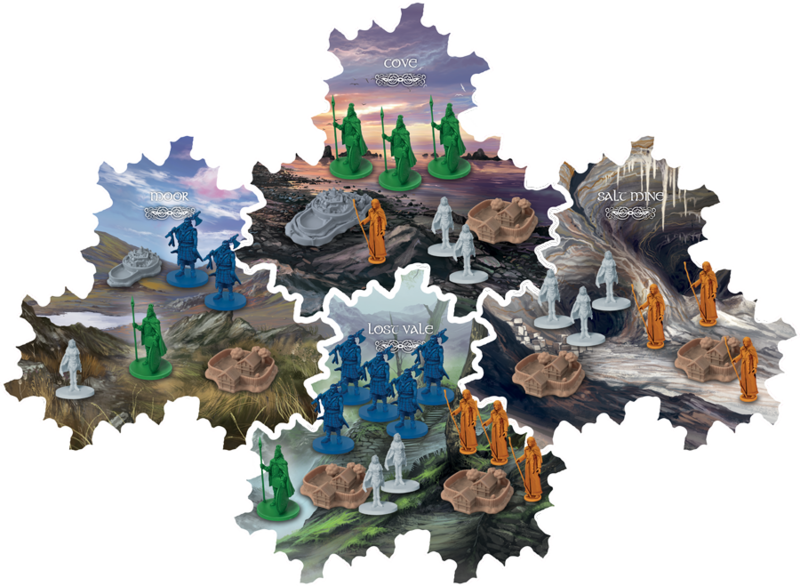 No single continued strategy can win in Inis, not destroying your opponents through clashes, building Sanctuaries, controlling the Capital, or exploring new territories. Every hand offers your new options, every part of the landscape is different, every opponent has his or her strengths and susceptibilities. To rule the emerald isle, you must emulate her: endure the changing Seasons, outsmart your opponents, and never give up.